West Bengal govt. has increased the scope and coverage of women welfare scheme named Kanyashree Pakalpa Yojna. Now, the ceiling of Annual Family Income of the beneficiaries has been lifted. This flagship scheme of the Bengal govt. offers incentive to all the unmarried girls above the age of 13 years. These incentives will ensure that girls stay in schools and delay their marriage till the age of 18 years. Also Kanyashree University is going to be setup in the state. This lifting of Annual Family Income Ceiling and extension of coverage of Kanyashree Prakalpa Yojna will cost the state exchequer an additional Rs. 200 crore. This announcement is made by the CM of West Bengal, Smt. 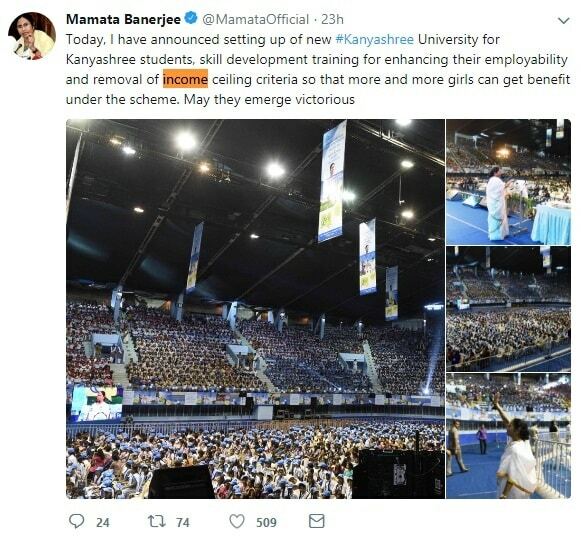 Mamata Banerjee. The total annual expenditure which the state govt. has incurred was Rs. 1200 crore for the previous fiscal year. Kanyashree Prakalpa Yojna is a flagship scheme of the WB government. This scheme was launched in FY 2013 in order to prevent child marriage particularly in economically weaker sections. Previously, only those beneficiaries whose annual family income from all sources was less than or equal to Rs. 1.2 lakh. Now this annual family income ceiling has been lifted. All the successful applicants b/w 13 to 18 years of age will get scholarship amount of Rs. 1,000 per year. They will also get one-time grant of Rs. 25,000 after attaining the age of 18 years and on remaining unmarried till that period. This scheme is now open to anyone and everyone with no restriction on the family earning. Smt. Mamata Banerjee said in a statement – “I am lifting the ceiling today. Everyone will stand to get the Kanyashree benefit. This will cost my government an additional Rs 200 crore but I know that they (the beneficiaries) will bring back Rs two lakh crore by preserving their respect”. Till date, there are around 50 lakh unique beneficiaries under Kanyashree Yojna. This is the dream project of CM Mamata Banerjee to setup “Kanyashree University” to ensure higher education for the girl child. In this new institution, all the Kanyashree Prakalpa beneficiaries will be granted assured admissions. Women & Child Development and Social Welfare Department will setup this Kanyashree University. Govt. will also ensure that technical education and training department will impart special skill training to the girls. This will enable them to appear for the placement drive and secure good jobs. UN has also awarded 1st place to the WB state for its public services for its Kanyashree Scheme.